"...What the kids are learning is that the boys’ job, the boys’ and men’s job is to do stuff, to pray to God, to go out there into the world, to be active, vocal members of society; and the girls’ job is to look pretty. You know, my dress is as pretty as the table! The table is set, just like my body is! You know, they’re picking up these messages from really early on, and it is so dominant. "And effectively what we’re saying is that there is no such thing as a gender-neutral Shabbat. We are not teaching that there is a Shabbat that belongs to everyone. We are saying that in order to keep Shabbat, you have to first enter your gender script. You have to first figure out, which side am I on? Am I on the girls’ side or on the boys’ side? And then I can figure out what Shabbat is. And that’s what kids are picking up. That’s what we’re teaching, and that’s what kids are picking up." "It’s a rare book that makes me furious. 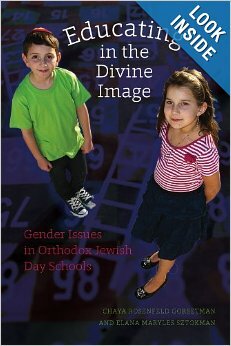 No, I’m not mad at Chaya Rosenfeld Gorsetman and Elana Maryles Sztokman, the authors of the excellent study “Educating in the Divine Image: Gender Issues in Orthodox Day Schools” (Brandeis University Press). What’s frustrating and infuriating is the material they present, which shows just how far behind the Orthodox Jewish world is in offering equal education to women. Before those who run Reform and Conservative days schools pat themselves on the back, though, Gorsetman and Sztokman also acknowledge almost all Jewish day schools fail to offer their students gender equality education. "Dr. Sztokman, JOFA’s executive director, earned her doctorate in sociology of education from Hebrew University. Together with Dr. Chaya Rosenfeld Gorsetman, she wrote “Educating in the Divine Image: Gender Issues in Orthodox Jewish Day Schools,” which was released last month. 'It examines gender issues in Jewish educational institutions, especially Orthodox day schools, with implications for other educational settings,' Dr. Sztokman said. 'It is about how we educate children into understanding gender; it looks at all kind of different practices in schools that teach boys and girls about social expectations of gender.' Those issues are not unique to the Orthodox world, she said, but 'it is a generation or two behind in having these conversations.'" Would you like to write a review of Educating in the Divine Image? Order your review copy today!